This month, again, I almost didn't make the challenge. Oops! But then I went back and reread the recipe this morning, intending to whipe it up today, and noticed it is a Hungarian cake. Oh! I have a Hungarian husband! I asked him if he knew about this cake, since he grew up over there and all, and he did. 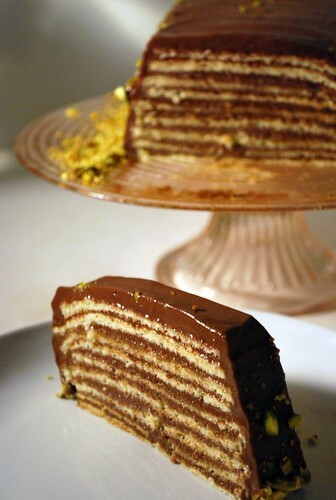 He said that the caramel layer isn't how his mom makes it, but I looked in all of our Hungarian cookbooks (we have a few) and all of them included the caramel layer. I decided to skip it, it's too hot to make caramel. We didn't miss it. Preheat the oven to 400, and line two cookie sheets with parchment paper or pan liners, then lightly grease them. Beat the egg yolks with 2/3 c powdered sugar and vanilla for a few minutes until thick and light yellow. Set aside, and clean your beaters. Whip the egg whites until soft peaks form, then sprinkle the remining sugar over the top. Beat another few minute until the eggs hold stiff peaks. Fold a big scoop of the whites into the yolks to lighten them, then fold in the rest, carefully. Sprinkle the cornstarch and salt over the top, and fold and fold, carefully, until everything is incorporated. Divide the batter evenly between the two cookie sheets and spread until even. Place one pan on the top and one pan on the bottom oven shelf, and bake 5 minutes. Switch, then bake 5 more, until lightly browned. Cool completely. Set a pan of water on to boil to use as a double boiler. Beat the eggs and sugar until pale and thickened in a metal bowl. Set the bowl over the boiling water, and beat the egg mixture with a whisk until it starts to thicken further. Whisk in the chocolate, and keep stirring for a few minutes until totally melted, 2-3 minutes. Remove from the heat and cool to room temperature. Whisk in the softened butter a few tablespoons at a time until fully incorporated. If your buttercream i too loose, like mine was because it's 90 degrees in my kitchen, just stick it in the fridge it's thickened up a bit. 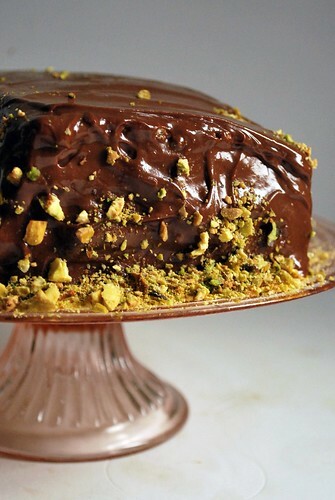 I edged mine with crushed pistachios. i made mine with caramel but didn't serve it with it... that is one good looking gluten-free cake! awesome job!! Mmm pistachios -- yum! Lovely torte! That looks incredible! I wish I skipped the caramel layer/brittle layer I substituted... maybe I wouldn't have been so disturbed by the outcome. Not my best work. Gorgeous job! The torta looks amazing =D. Wonderful photos as well! 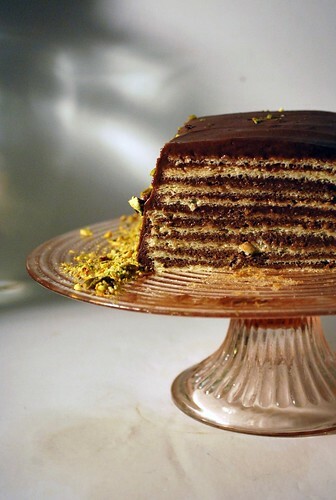 Your torte looks divine, especially that shiny buttercream....and all those layers! And pistachios! Nice job! I'm glad to know the caramel layer isn't necessary (didn't like it at all!) Looks lovely! Glad you decided to make it because it turned out lovely and looks delicious! 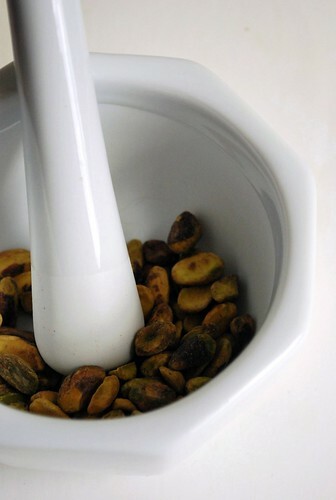 LOVE the pistachios in lieu of the gazelnuts..adds color and of course, yummy pistachio goodness! Your torte is so pretty....such nice art work! wow you did an amazing job on this one - it really looks so pretty and prefect!! I bet its devilish!! 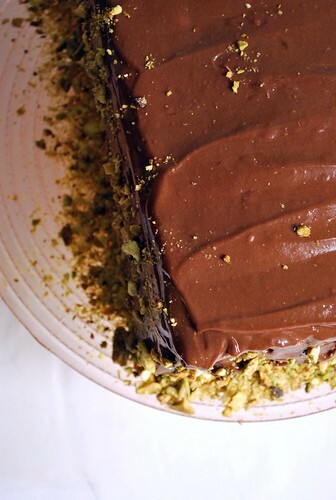 It's interesting to see someone else using crushed pistachios to line a cake. I usually just see pecans and peanuts..maybe almonds, but my mother in law uses the pistachios and it's just such a unique look and taste! Keep up the good work with this wonderful blog!